One night eight months ago, a group of beer aficionados was attending an “Art of Beer” class at the Markeim Arts Center. The group was attending the monthly class, learning about the nuances of brewing beer. After the class, a group of students decided to stick around and talk among themselves. What started as a question asked in jest would later turn into a business that could change the course of downtown Haddonfield. Yeastie Boys LLC, comprised of Chris Thomas, Victoria Jensh Cummins, Pete Gagliardi, Jeff Farrell and Bob Hochgertel, were on hand Tuesday, Feb. 21, when the Haddonfield Zoning Board approved the zoning application for the brewery, King’s Road Brewing Company. Hochgertel, a member of the LLC, was one of the people who was a part of the group that stayed after the class. Haddonfield is a “dry” town, meaning the sale of alcohol is not allowed in the town. However, because the brewery is not selling food on the premises and it will be making its own beer on the property and not selling another brand, it was deemed as a retail property and could open. The nano brewery is following a trend going on in other “dry” towns. Pitman and Collingswood also have a brewery. However, do not look for there to be a change in philosophy when it comes to changing the liquor ordinances. The search for a location was arduous. 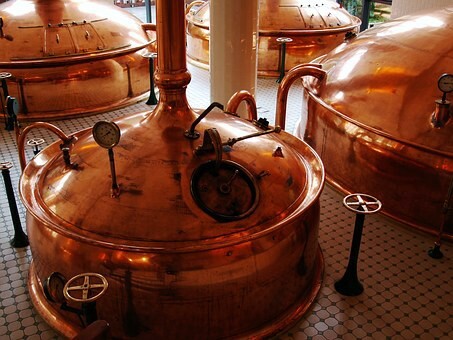 The group had to secure an address because part of the license application process requires a brewery to have a confirmed address. They explored a couple of sites in town, but for one reason or another, It did not work out. Meanwhile, they were working on other parts of the business including names for the brewery and pricing equipment. They contacted Scott Morrison, a brewery consultant who helped build a lot of the larger breweries in the region including Ship Bottom Brewing Company. Everything was set except the location was ready to go. One day, Remi Fortunato of the Partnership for Haddonfield called the group and Hochgertel showed the location at 127 Kings Highway. The Gibbs Tavern was originally built in 1777. The Yeastie Boys LLC is hoping the brewery will limit the number of people who leave out the town to buy alcohol and patronize the businesses where they purchase it instead of coming back to Haddonfield. “We are hoping that by having growlers to go out of our nano-brewery that people could order the beer and go to sit in one of the great restaurants in town,” he said. As they are getting everything set to move forward, they have received help from other members of the brewing community. If everything goes well, the brewery will open in late 2017.